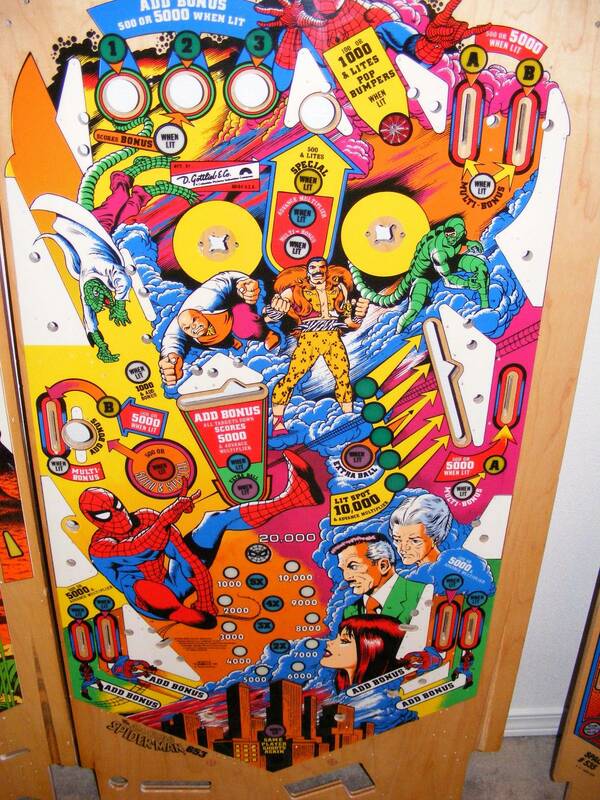 » Forum » All Pinball » Is Gottlieb Spider Man worth restoring? » Is Gottlieb Spider Man worth restoring? Is Gottlieb Spider Man worth restoring? I've got an NOS clear coated Spidey playfield but I've never played the game. The artwork is beautiful but In your opinion is the gameplay good enough for it to be a keeper? I've had one in my collection since 1991, but I played it "back in the day". Others will feel different about it. Do you have only the PF, or do you have the entire game? Get that thing scanned! Plenty of folks have blown out playfields who could use a scan to help with repainting or decals. It's one of the more desirable titles just because of the theme. I haven't had the opportunity to play one yet, unfortunately. I have a project machine but it's in parts. I'll consider scanning the PF. I think a cruise scan would run about $2-300. owners would gladly help I am sure. unobtanium!! An HP 4670 would work too if someone nearby has one. My 1st game ever, still in my collection. More because of nostalgia and it is a piece of art. If you decide to sell the playfield I would be interested. If you decide to sell the playfield I would be interested. Yup. Thats what I was going to say too and the reason o asked the question above. I'd love to install an NOS PF into mine! Have you tried contacting pbresource or CPR to see if they could scan it to make a rerun? This way you would probably make most of your money back from the purchase of it. I have that scanner but it only scans a little bit at a time, it would need to be restitched in photoshop which is a humongous pain in the arse. The resolution would definitely be higher than a cruse scanner though. My experiences with both of those companies haven't been great. I offered to do the artwork for Fireball but got pulled into mess between CPR and Planetary Pinball. Here's a pic of the playfield. I think a cruise scan would run about $2-300. I don't know know if you're a guy that restores games for a business. If it was me, I would only restore games that I would keep. There are too many games out there I'm interested in, to take the time to restore a game I don't want to keep unless you have a good reputation restoring games for other people. I have that scanner but it only scans a little bit at a time, it would need to be restitched in photoshop which is a humongous pain in the arse. Scan it with 25% overlap , and leave it as individual scans. Do not stitch them together. The resolution would definitely be higher than a cruse scanner though. I do use overlap but it's still a pain to match the angles, color saturation, and sometimes a scan or two blurs a bit. Someone will have to stitch it into one piece eventually. I use a place in LA that does work for Disney among other high end clients. I scanned an entire arcade cabinet in 1 shot and noticed when I zoomed in tight a lot of detail was blurry. When I scanned it myself piece by piece it's super clear. It was definitely more than $100. Maybe you have a better source for cruse scanning. You need to use a straightedge clamped the length of the playfield. Make 7 scans down one side, then move the straightedge and make your second run. and sometimes a scan or two blurs a bit. The cable on the HP4600 is old and stiff. Make sure you clamp it if it's moving the scanner on the waxed playfield. Someone will have to stitch it into one piece eventually. That's true, but better to let someone who has a high end version of PS do it automatically (File>Automate>Photomerge). Let alone it's much easier to send someone 14 files than one giant whale. Also, scan it in the dark. I've noticed better color consistency when there is no ambient lighting in the room. A bulky arcade cab is probably viewed as more of a hassle than bringing in a few flat playfields. A print shop that sees you as a regular customer who is "no hassle" to them will give you the best deal. Bringing donuts or bagels always scores you big time. Just to illustrate the difference between with and without lights, here are two scans I did of a cabinet as a comparison a while back when I was testing a few different techniques. With the scan done with the lights on, you can see some of the squares for each individual scan, since there are color differences between each scan. This is most noticeable in the lower right corner. Also note, that any difference in height (like the height of the rail) will affect color and focus of a scan. Additionally, banding only seems to happen on reflective surfaces of a uniform color. Some great tips, thanks. I've restored well over 100 arcade pieces but I'm still learning more. I'm using Adobe creative suite 5. Which is really screwed over now that I upgraded to El Capitan. What a pile of crap that is. I'll have to look into photo merge. Yeah, learned the scan in the dark trick a little while back. Makes a big difference.